Welcome to Axiom PT & OT Plus resource on concussions. The brain is an extremely sensitive organ and is the control centre of our body. When reflecting on common injuries resulting from sport or daily activities, injuries occurring to the brain are often overlooked. Injuries to the brain are extremely common, particularly if you partake in sport, and even more so if you partake in a contact sport. You don’t need to participate in a sport to cause injury to your brain. Non-sport related injuries to the brain can occur during activities such as falls or motor vehicle accidents. Injury to the brain from these or similar causes is termed a concussion. A concussion in the medical world is considered a mild head injury or mild traumatic brain injury (TBI). Due to the injury the brain cannot function the way it normally does. Your ability to perform your normal activities with the same speed, reaction time, and precision as prior to the injury can be significantly altered. Fortunately the symptoms of a concussion in most cases are temporary and resolve over time. With each concussion, however, there is a small chance that permanent brain damage can occur, so proper treatment and sound medical advice regarding management of this injury is crucial. What is the anatomy of the brain? The brain is a soft organ that sits in the hard skull for protection. It is cushioned by cerebrospinal fluid that fills in the space between the skull and the brain. The cerebrospinal fluid acts like packing foam that protects your fragile items from both the sides of the hard moving box itself and from the rapid or sudden motions that the box may endure. The brain is the control centre for all of the body’s activities. Damaging the brain can alter your ability to perform tasks both mentally and physically. Typically concussions are thought to be caused by direct blows to the head, such as in boxing or bar fighting, or by hitting your head on the ground during a fall, but indirect forces to the head are also common causes of concussions. For example, a fall onto your buttocks or onto any other part of your body can transmit a force strong enough to your brain to cause a concussion, even if you do not hit your head during the fall. Similarly, a blow to your neck, face or any other area of your body that is severe enough to transmit the force to your head can cause a concussion. 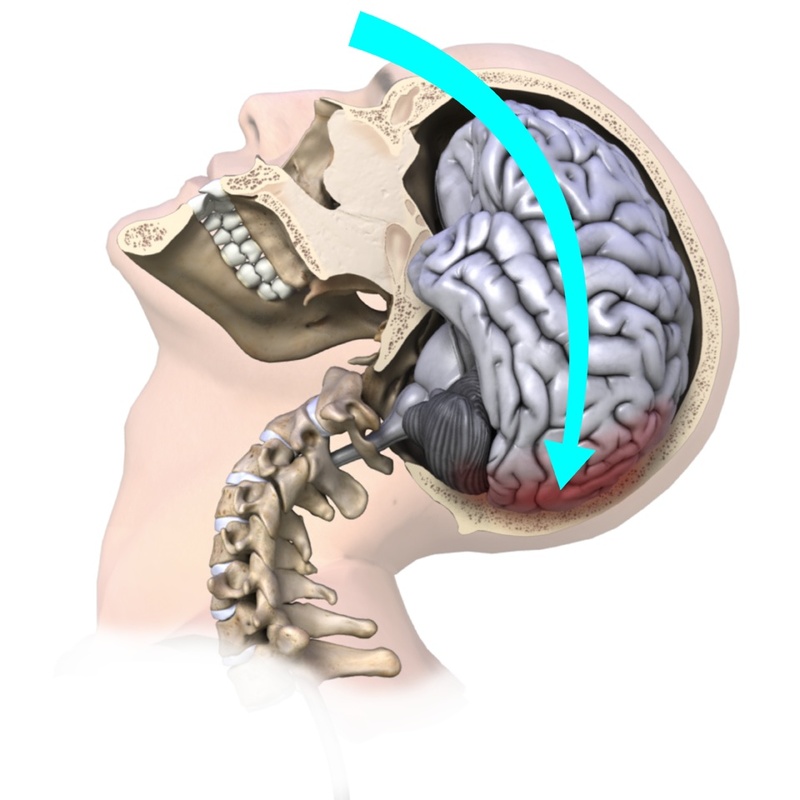 Motor vehicle accide nts often similarly cause concussions due to the whiplash motion of your neck which subsequently forces your brain to rapidly hit the inside of your skull. Shaken baby syndrome is another example of this indirect mechanism of brain injury, as are explosions where your body is rapidly thrown back. Signs and symptoms of a concussion can vary extremely between people. It is not always obvious that someone has a concussion, so if the mechanism of injury for a concussion was present, a concussion should always be suspected and thoroughly investigated. You do not need to lose consciousness to suffer a concussion, and in most cases there is no loss of consciousness. If you do lose consciousness, however, you have most certainly sustained a concussion. Any loss of consciousness should be taken seriously, and any bouts lasting more than approximately a minute are considered severe. Signs and symptoms of a concussion can vary extremely between individuals and can last days, weeks, months, or even longer in some cases. Fortunately, however, in the majority of cases symptoms usually resolve within 7-10 days. Other signs and symptoms of a concussion that may be present on their own or in combination are concentration difficulties, decreased attention, difficulty with mental tasks, memory problems, difficulties with judgment, a decrease in balance and coordination, a feeling of disorientation, a feeling of being ‘dazed,’ fatigue, blurred vision, light and/or sound sensitivity, difficulty sleeping or sleeping more than usual, being overly emotional, being irritable or sad, neck pain, a feeling of ‘not being right’, and ringing in the ears. Amnesia may be another symptom. Two types of amnesia can occur: Retrograde amnesia which is forgetting events that happened before or during the concussion event, or anterograde amnesia, which is when you do not form new memories about events that occurred after the concussion. In severe concussions, a change in personality may even occur. If a patient shows even one sign or symptom listed above this should be indicative of a concussion occurring and a full concussion evaluation should proceed. Signs and symptoms that are even more severe after an injury to the head, such as recurrent vomiting, a change in pupil size, blood or fluid coming from the ears or nose, seizures, or obvious physical coordination or mental difficulties indicate a severe brain injury and require immediate emergency attention. In most cases signs and symptoms appear immediately after the concussion has occurred, however in some cases the signs and symptoms can be delayed by a few hours or possibly even days. 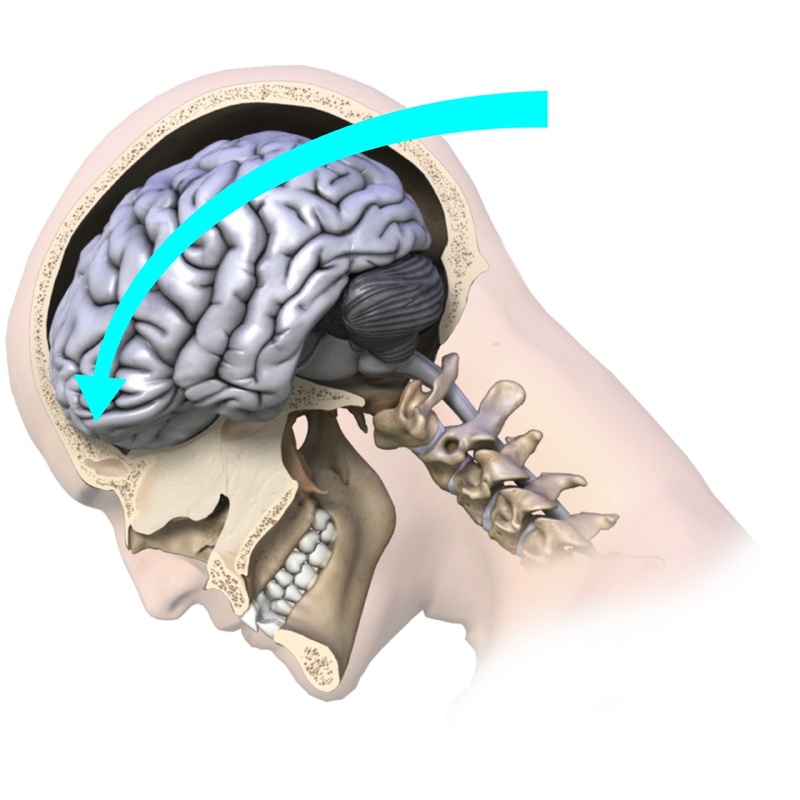 For this reason if the mechanism of injury suggests a concussion despite a lack of obvious symptoms being immediately present, the patient needs to be thoroughly examined for latent development of concussion signs or symptoms over a reasonable time frame, and a concussion must be thoroughly ruled out before returning to activity. How do health care professionals diagnose a concussion? Diagnosing a concussion can be easy in cases where there was an obvious mechanism of injury involving a blow to the head, and when there are immediate signs and symptoms to indicate the brain has suffered an injury. Diagnosis of a concussion begins with a complete history of the mechanism of injury. As stated above, any blow to the head or force through the body that is strong enough to transmit a force to the head will lead your health care professional to the suspicion of a concussion. At a sporting event, often the sideline health care professional is privy to having seen the mechanism of injury, which aids in diagnosing a concussion. Included in the history will be questions regarding any previous concussions that the patient may have incurred. The more concussions you incur, the higher your chances of sustaining another concussion, and it can more easily occur with decreased force. Thorough questioning regarding the patient’s symptoms is the next step to diagnosing a concussion. With sporting events, immediate symptom evaluation should occur on the sidelines by a health care professional or a coach well educated in concussion signs and symptoms. If neither is available, immediate referral to a doctor should occur. As symptoms can appear immediately or can be delayed, monitoring of symptoms from the time of concussion for at least a few hours is necessary. As mentioned above, symptoms may even be delayed a few days so if the mechanism of injury indicates a potential for a concussion, the development of symptoms needs to be monitored for a few days after the injury, and during this time, the patient should not be allowed to participate in sport or challenging cognitive activities. It is important to monitor for not only the initial emergence of any concussion signs or symptoms, but also for the worsening of any existing symptoms, or any decline at all in the patient’s ability to perform physical or cognitive tasks. The evaluation of cognitive function should occur when initially diagnosing a concussion. General questions regarding orientation that have traditionally been used such as ‘who are you?’, ‘where are you?’, and ‘what time is it?’, have not been shown to be sensitive enough to pick up a decline in cognitive function. For this reason diagnosis of a concussion should not be ruled in or out based solely on these general questions. More advanced questioning can be useful in helping to determine a decline in cognitive function indicating injury to the brain. For instance, at a sporting event questions such as ‘who scored the last goal?’, ‘which team was played last week?’, or ‘how far into the game is it?’ can help to delineate a concussive state. More advanced sideline concussive cognitive tests are also available and are useful in sports where concussions are common. Outside of sport, more in-depth questioning such as the exact location of a street, or questions regarding the full date and time of day may assist in determining the patient’s cognitive status. Whether on field, at the emergency department, or in the medical clinic a thorough physical examination will need to be completed. This examination is to look for signs such as pain in the neck, which may indicate a concurrent cervical spine injury, amnesia, or soft tissue injury to the skull. Following the physical examination a clinical neurological examination is completed including tests for strength and sensation, reflexes, coordination, visual and auditory disturbances, and cognitive impairment including deficits to memory or concentration. A thorough examination of the patient’s balance and gait will also be completed. Impairment in balance can often be seen as a clinical sign of reduced motor function when a patient suffers a concussion. Balance that is not disturbed, however, does not exclude the diagnosis of a concussion having occurred. 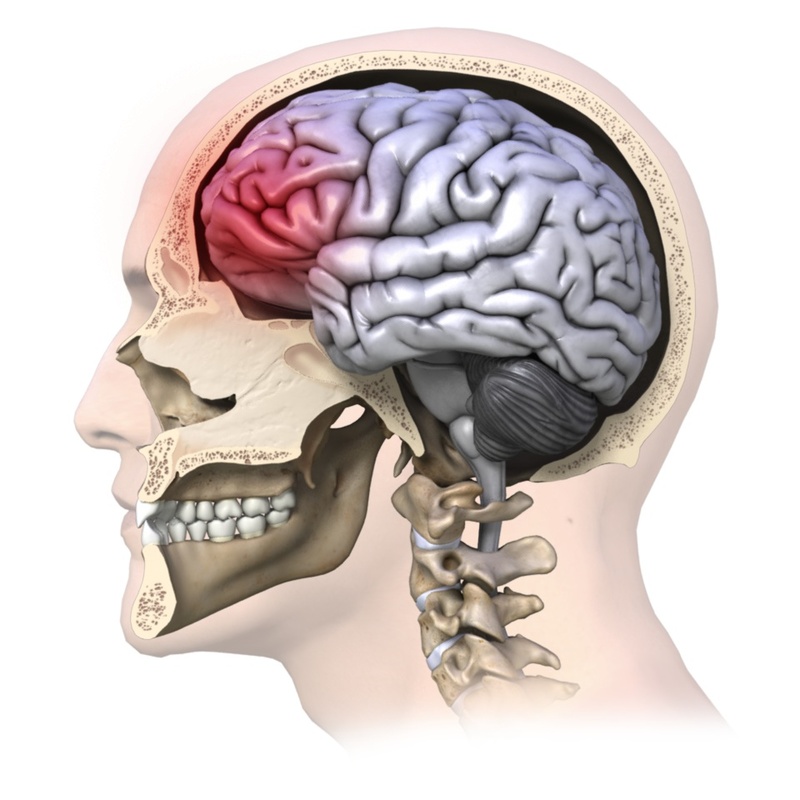 A concussion is a functional injury to the brain rather than a structural injury. This means that damage to the brain tissue generally cannot be physically seen. For this reason, neuroimaging tests such as computerized tomography (CT) scans or magnetic resonance images (MRI) that look at brain structure are not needed to diagnose a concussion. Normal findings are common when imaging is completed in patients who show clinical signs of a concussion. In other words, you can still have a concussion, even a severe one, despite CT scans or MRI results being normal. For this reason, neuroimaging is not routinely ordered if a concussion is diagnosed, unless true structural damage to the brain is suspected. X-rays of the skull may be considered to rule out bony injury to the skull itself if the mechanism of injury warrants it. If structural damage to the brain is suspected a CT scan or MRI is necessary as these are currently the best neuroimages readily available to view the structure of the brain. Structural damage may be suspected when concussion signs or symptoms are severe. For example if there has been a significant loss of consciousness (greater than one minute), significant memory loss, a change in pupil size, repetitive vomiting, seizures, or rapidly worsening levels of cognition or physical ability. Even if the concussion symptoms are not severe, but the mechanism of injury involved enough obvious force to cause structural damage then a neuroimage of the brain is indicated. For example, concussions due to falling from a height or from a high-speed motor vehicle accident would warrant a neuroimaging test. Neuroimages may also be more routinely ordered in adolescents or children due to the fragility of their developing brains. Currently there are no neuroimaging tests used routinely that can identify the changes in the brain that relate directly to the clinical signs and symptoms seen with a concussion. New MRI neuroimaging testing which is sensitive to brain electrical activity (functional MRIs also knows as fMRI) and MRIs that are more sensitive to minute structural damage (perfusion and diffusion tensor imaging), as well as other types of new imaging technologies are currently being trialed and extensively researched. These tests show hope in potentially creating a gold standard neuroimage test that identifies a concussive state. Some major hospitals or clinics may already have these tests available, and if so, these tests add valuable information to diagnosing a concussion and analyzing clinical symptoms. At this stage, however, not enough research has been completed on these tests to warrant their use as a standard procedure in the diagnosis of a concussion. The basis of treatment for all concussions is rest until signs and symptoms resolve. Once signs and symptoms have resolved then a graduated increase in both cognitive and physical activity is implemented while monitoring symptoms. Once graduated activity is implemented and tolerated then a graduated return to sport or work schedule can be considered. Rest for a concussion means both a physical rest but also a cognitive rest. This means not only will sporting activities or manual work activities be excluded, but also mental activities requiring attention and concentration such as television watching, computer work, reading, texting, or doing schoolwork. The brain simply needs time to heal, as with any other injury to the body. The eyes and ears can be particularly sensitive to sound and light after a concussion and even normal lights and sound can precipitate symptoms so any stimulus of this sort needs to be avoided or limited. If a concussion is suspected during a sporting event the player should be immediately removed from the game and not be allowed to return to play that day under any circumstance. Serious injury to the cervical spine should be ruled out and then a full concussion examination should proceed. An ice pack can be applied to the neck or head if pain is present in either of these areas. If it is unclear whether a concussion may be present, it is recommended to err on the side of caution and assume a concussion is present until thoroughly ruled out. The common sporting cliché of “when in doubt, sit them out” should be applied. In the event of an injury occurring outside of sport that involves significant impact or force, such as a motor vehicle accident or fall from a height, one should assume that a concussion has occurred until this has been thoroughly ruled out. Immediately after a concussion a patient should not be left alone and should be monitored for any development of new signs and symptoms or any deterioration in existing signs and symptoms over a period of a few hours. If the patient does not exhibit any signs or symptoms indicating a severe concussion and they have not deteriorated over several hours of monitoring them, it is fine to let them sleep, as this will aid their recovery. They do not need to be awoken every few hours unless a doctor has examined them and has specifically suggested that this be done. In severe cases, some concussed patients may be kept in the hospital for monitoring overnight. Fortunately the majority of concussions (80-90%) resolve in a short period of 7-10 days. Several factors, however, may lengthen recovery times and will require typical management of a concussion to be modified. Severe concussions or those concussions where the symptoms last longer than expected will require a longer recovery period. Patients who have had a loss of consciousness of greater than one minute also generally require a longer recovery period, as do children and adolescents whose brains are still developing and are therefore more sensitive to injury. Repetitive concussions create cumulative injury to the brain and therefore generally require a longer period to recover after each time they occur. There is also a thought that females may incur more severe concussions due to their lesser neck musculature compared to males. The increased male musculature may help to absorb some of the forces that the body (including the brain) endure which may decrease the severity of a concussion. For this reason females may require a longer recovery period before returning to work or play. Interestingly, patients who suffer from migraines, mental disorders, depression, sleep disorders or attention deficit syndrome may also require a longer period to recover and these factors should be considered when planning return to activity protocols. Neurocognitive testing (testing one’s ability to think) can be useful as an objective measure of a patient’s cognitive abilities, reaction time, and overall mental processing abilities as they recover from a concussion. It is not uncommon for a patient to ‘feel fine’ after a concussion, including having their physical symptoms resolve, but for their cognitive abilities to still be deficient. For many high level sports teams, a baseline neurocognitive test is done pre-season so that if a concussion occurs, test results post-concussion can be compared and used as an evaluation of whether the player is back to pre-concussion status before returning to play. There are several neurocognitive tests being used and there is not one gold standard test yet identified. Most tests consist of computer-generated tasks that measure reaction time and cognitive ability. Tests are available in a variety of languages and normative value ranges are available if a pre-test has not been completed. Neurocognitive testing should not, however, be used as a sole predictor of return to activity timelines. All physical symptoms must still be considered, a full medical clearance completed, and then a graduated return to play protocol implemented. Examples of these tests include The Axon Sports Computerized Cognitive Assessment Tool (CCAT) and The ImPACT test (Immediate Post-Concussion and Cognitive Test.) Other tests that are designed to be administered once a concussion has occurred, such as the SCAT3, can also be administered pre-season in order to establish baseline information about each individual, however they are not as encompassing as the neurocognitive computerized tests available, therefore when available, a baseline computerized neurocognitive test should be carried out. Post-concussion neurocognitive testing should not, however, be used as a sole predictor of return to activity timelines. All physical symptoms must still be considered, a full medical clearance completed, and then a graduated return to play and return to learn protocol implemented. The best treatment for a concussion is prevention. Regarding concussions from sport, protective equipment such as helmets and mouth guards should be worn to absorb forces, and equipment should be the latest in technology where feasible. New equipment such as helmets and other protective pieces are continually being researched and tested in order to improve their shock absorbing ability and decrease the severity of concussive forces sent to the brain. Athletes and non-athletes should maintain their body strength and physical fitness as there is the possibility that stronger musculature might protect against forces transmitted through the body and also better control any abhorrent forces transmitted to the head and neck. This musculature may decrease the severity of any injury sustained. Patients are also encouraged to decrease risk-taking behavior in their sport or everyday lives and take preventative action against injuries to their head. Seat belts should be worn at all times when in a vehicle. Helmets should be worn for biking and hard hats during manual labor tasks. Ladders should be well secured to avoid falling from a height. Unnecessary hits during sport and overall sporting risk-taking behaviors should be minimized or avoided. In addition, athletes should stay well hydrated while partaking in their sport so that their cognitive awareness for injury-causing situations is at peak performance throughout their game. Even something as simple as removing or securing throw rugs in your home can assist in decreasing the risk of a fall and a resultant concussion. Can medications help me after a concussion? Immediately after sustaining a concussion medications should be avoided until a full assessment of the concussion signs and symptoms can be reviewed. Even over-the-counter drugs such as ibuprofen, nurofen, paracetamol, or acetaminophen should not be taken after a concussion until a doctor is consulted. Once reviewed by a doctor, if medication is prescribed its aim is for one of two reasons: Firstly, medication may be prescribed to treat the concussion injury itself in an attempt to decrease initial symptoms or duration of symptoms. Secondly, medication may be used to deal with the symptoms arising from the concussion such as sleep deprivation, or emotional lability. Many doctors choose not to medicate at all when treating a concussion in order to not mask any symptoms. If medication is prescribed the doctor who prescribes it should closely monitor the patient and all health care professionals involved in the patient’s care should be aware of how the medication may affect the symptoms of the concussion. Alcohol and illicit drugs should be strictly avoided when recovering from a concussion. What will I do to rehabilitate from a concussion? Returning to sport, work or everyday activities after a concussion requires a specific return to activity plan that is closely monitored for the re-appearance of concussion signs and/or symptoms. Your Physical Therapist at Axiom PT & OT Plus, along with consultation from your treating doctor, can create, implement, and monitor your return to activity plan. If you are a student, it is recommended that your health care professional contact your school to ensure they are aware of the recent concussion and to also ensure they are on-board with Return to Learn and Return to Activity guidelines. It is pertinent that all involved in the care of a concussed patient follow the same conservative guidelines in order to optimize recovery. The backbone of rehabilitating from a concussion is rest until symptoms subside, then a graduated return to cognitive and physical activity without creating any symptoms. Returning to work or sport following a concussion proceeds through a basic sequential process. Your Physical Therapist will specifically guide you regarding the amount of activity you should engage in and will closely monitor you for signs or symptoms to ensure the healing brain is ready for each progressive level of physical or cognitive activity. Return to competition for athletes at a graduated level (ie: athlete returns to play in one quarter or only on certain offensive/defensive plays.) Non-athletes return to work/school gradually (ie: half days to start or fewer cognitive tasks during a full day). Each of the 6 stages of the general return to activity plan will occur over a 24-hour period, which means that for athletes suffering a concussion, full return to sport will not occur earlier than approximately 6-7 days after the initial injury. If at any stage during rehabilitation signs or symptoms arise, your Physical Therapist will ask you to cease the current activity and return to resting for a minimum of 24-hours, or until all symptoms have resolved. Activity will begin again once all symptoms have subsided. Cognitive and physical tasks should begin again at the same level where no symptoms occurred (it is not necessary to return all the way back to stage one unless it is the progression to step two that has caused the symptoms) and proceed then to the next level only once the task at hand has been completed without generating signs or symptoms. Each step can be progressed if it is undertaken without any symptoms arising during or after the exertion, and your Physical Therapist is content with all aspects of your exertion ability and your physical response to this exertion. It is worth mentioning again that no step should be progressed earlier than 24-hours after the previous step. Latent signs and symptoms may appear within this time frame so it is important to allow sufficient time for these to emerge, but also to give the brain time to recover from the exertion it has endured during the rehabilitation process itself. By following a progressive sequence of increased physical and mental exertion you will be allowed (and encouraged) to exert yourself during rehabilitation as long as this exertion does not bring on signs or symptoms. In other words, exertion both physically and mentally during rehabilitation should be sub-maximal and below a symptom threshold. As mentioned above, in some cases a longer rehabilitation with a longer return to activity plan may be necessary; such as when loss of consciousness was greater than one minute, or in patients who have had repetitive concussions. In these cases, patients may find that they must continue doing activity at one threshold for longer than the 24-hour period while the brain heals. Allowing an athlete to exercise sub-maximally while recovering from a concussion (rather than not exercising at all) is very beneficial to maintain their fitness and psychological state while sitting out with an injury. While engaging in your rehabilitation plan, it is important to remember that any additional physical or cognitive activity outside of this plan adds to the stress that the healing brain must endure. Going to the movies, completing your taxes, or walking around the shopping centre for the day will all add stress to your healing brain. It is best to report all extracurricular activity that you anticipate engaging in, or need to engage in, to your Physical Therapist so they can take this into account when developing and modifying your rehabilitation plan. Your Physical Therapist at Axiom PT & OT Plus will be fundamental in guiding your rehabilitation and return to activity plan after a concussion. They will provide you with criteria regarding the levels of physical and mental exercise to work towards, and will also monitor physical exertion signs, such as your heart and breathing rate, in order to appropriately progress your physical exertion levels from light through to heavy. Your symptoms will be documented in order to monitor for any changes with increasing levels of exertion. Special tests for balance and physical coordination may be used to give your therapist an indication of your physical ability as you recover. Your Physical Therapist will also analyze your individual circumstances and specifically tailor your return to activity to incorporate any special circumstances that may apply to you. For instance, if you are returning to a sport, such as soccer, where the risk of a second concussion is high, your Physical Therapist may delay your return to play for a longer period than if you are returning to a sport such as tennis, or not returning to any sport, but rather a work or scholastic situation where your risk for a second concussion is low or none at all. Factors such as your gender, your predisposition to migraines, learning disabilities, and any previous concussions sustained will also be taken into consideration when tailoring your individual rehabilitation plan. If you received any concurrent injuries when you sustained your concussion, such as a soft tissue injury to your neck or any other injury, your Physical Therapist at Axiom PT & OT Plus will simultaneously treat this injury. Your therapist will ensure that not only your brain is ready and prepared to return to your regular activity, but that the rest of your body is also ready to begin. Manual therapy, massage, electrical modalities and specific exercises may be used to treat your neck. It should be noted that in some cases hands-on treatment to the neck area after a concussion can bring symptoms on. Your therapist will closely monitor for this, and treatment will be modified accordingly. Each patient is unique in both their concussion signs and symptoms, as well as in the sport or job they need to return to, therefore close and frequent monitoring of your return to activity plan by your Physical Therapist is necessary. Your Physical Therapist at Axiom PT & OT Plus will be in close consultation with your doctor and any other health care professionals that have been involved in the care of your concussion injury to ensure you are returning to your regular activity as quickly but also as safely as possible. Medical clearance from your doctor will be needed before certain levels of activity are undertaken. For those returning to sport, your therapist may also consult with your coach to discuss implementing a gradual return to activity within your practices and matches. It is worth mentioning again that full recovery from a concussion involves the ability to both physically as well as cognitively handle complex tasks without creating any symptoms. Decreased cognitive function is more easily overlooked than physical symptoms and therefore special attention will be paid by your Physical Therapist to your cognitive function as you recover. Your therapist may use neurocognitive testing to get an objective measure of where your reaction time is at, or to ensure that mentally challenging tasks do not provoke symptoms. Variables such as stress in a job or the stress of an important sporting event can add to the cognitive demands of any task at hand so these variables will be taken into consideration by your Physical Therapist when your return to activity plan is being implemented. Other variables such as noise and lights can easily aggravate symptoms so will also be taken into account when in the final stages of returning to full activity. For instance, the music and lights during a dance/stage performance, the bright lights of a nighttime playoff game, a match within a large busy stadium, or an office/classroom that is lit with fluorescent lighting can aggravate symptoms. Where possible, your Physical Therapist will attempt to incorporate your regular sporting or work environment into your return to activity plan to ensure the activities you engage in are as similar as possible to those you will incur in your normal environment once you are fully back into action. If even mild signs or symptoms resulting from the concussion are lingering it is absolutely critical that you do not return to regular activity or sport, particularly where the possibility of incurring another concussion is present. If you do return to activity, the risk of sustaining a second and more damaging concussion is increased as your lagging cognitive function and reduced reaction time leaves you more vulnerable to a second injury. This is termed Second Impact Syndrome. Second-impact syndrome (SIS) is a condition that occurs when a patient incurs a second concussion before full recovery has occurred from an initial concussion. The second blow does not need to be forceful in order to cause SIS. SIS is considered rare but is a very serious condition and can result in death or severe brain damage as the brain rapidly swells and/or bleeds following the second blow. SIS occurs most often in young athletes under the age of approximately 25 and when it does occur has a high fatality rate among these athletes. Due to the real possibility of SIS a conservative rather than aggressive return to activity protocol should be implemented following a concussion. Post concussion syndrome (PCS) is the presence of symptoms from a concussion, which last much longer than expected. Symptoms may last weeks, months, or occasionally even years. Symptoms are varied but can be physical, such as a headache or dizziness, or may be cognitive such as difficulty concentrating or performing mental tasks. Other symptoms such as light sensitivity, or emotional irritability may also occur. The cause of PCS is unclear. One belief is that structural damage to the brain causes the ongoing symptoms. Others believe, however, that the symptoms develop due to a psychological or emotional reaction to the initial injury. In any case it is considered abnormal and a complication of a concussion. Fortunately in most cases PCS symptoms resolve in approximately 3 months. Depression has been reported as being a potential long-term consequence of concussion and when present, may be considered a symptom of PCS. Further research is needed to accurately link concussions to a depressed state, however trends in research are focusing on the possibility that the greater the number of concussions sustained, the greater your risk for depression. Axiom PT & OT Plus provides services for Physical Therapy in Tuckahoe and Yonkers. The brain is a delicate, sensitive, and complex organ. Injury to the brain has the potential to affect aspects of both physical and cognitive functioning in activities of daily living as well as during activities of sport and work. Most signs and symptoms of a concussion resolve relatively quickly, but in some cases signs and symptoms can last longer than anticipated and continue to affect a patient’s ability to function. The best treatment for concussion is prevention. When a concussion does occur, however, the seriousness of the event needs to be acknowledged by the patient, the health care professional, and any other caregiver involved. A prudent and cautious attitude to treatment, recovery, and return-to-activity must be implemented.